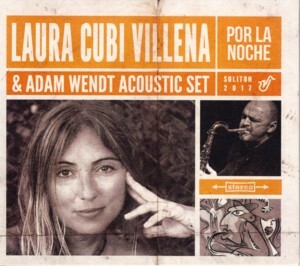 This is an album by Spanish vocalist / lyricist Laura Cubi VillenaFind albums by this artist, recorded with the Polish ensemble led by saxophonist Adam WendtFind albums by this artist, which also includes accordionist Cezary PaciorekFind albums by this artist (Pawel ZaganczykFind albums by this artist also plays accordion on one track), bassist Jaroslaw StokowskiFind albums by this artist and the Amber String QuartetFind albums by this artist. The album presents twelve original tracks all composed by Wendt with lyrics by Villena. Villena and Wendt collaborated already on the last album by Adam Wendt Acoustic SetFind albums by this artist ("Acoustic TravelFind albums with this title") which apparently worked well for both of them, leading to this full album recorded together. The music is only marginally Jazz oriented and offers a dominant Spanish / Latin flavor, using elements of Tango and other World Music motifs. The music is beautifully arranged and the instrumental performances are all excellent, as expected from these veteran pros. The accordion parts are especially beautiful, as are the heartfelt saxophone solos. Villena has a deep and sensuous voice, with a rasping coloring, and her delivery is ideal for the melodic contents and sounds authentic and striking. Overall this is a fine Jazz-World Fusion / Smooth Jazz offering, which does not compromise any musical qualities and offers first class entertaining. For lovers of Latin music and the Tango, this is quite a feast. This music, with the help of a good bottle of wine, is able to teleport the listener back in time to the streets of Buenos Aires, where the Tango used to be a way of life.